“Coraline”, “ParaNorman”, “The Boxtrolls” and “Kubo and the Two Strings” all raised the bar when it comes to the medium of stop-motion animation. Each challenged storytelling conventions. Each took visual risks that paid off. And they all held firm against the temptation to please audiences of all ages. 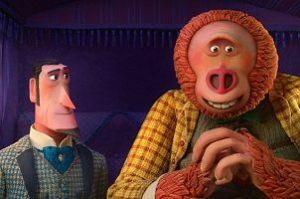 Unfortunately, Laika Animation’s fifth feature, “Missing Link”, goes against the traditions set by those previous films. It’s a standard, sometimes silly, location heavy adventure that blends stop-motion with new CGI techniques — with mixed results. Hugh Jackman infuses style and confidence into brash 1800s explorer, Sir Lionel Frost. The adventurer is always on the trail of the next great discovery. He’s hoping to impress his older colleagues who don’t see him as legit. So he travels from Britain to the state of Washington in search of the rare Sasquatch. His initial encounter with the 8 feet tall Mr. Link (Zach Galifianakis) lacks the comedic impact it should have. But there’s something about this pairing that makes you want to give this movie a chance. It’s unfortunate that the “uniqueness” soon wares off, as the script piles one passé element on top of another. Writer/director Chris Butler, the co-director of “ParaNorman”, gets about halfway there with his final product. “Missing Link” attempts to be a buddy movie, an action movie, a romance and a story of self-discovery — all in one. But it never goes deep enough with any of these elements. The main characters are constantly on the move. Frost, Link and companion Adelina Fortnight (Zoe Saldana) travel around the globe in search of Link’s true home. The trio is either walking, on a train, on a stagecoach, on a ship or scaling mountains and ice walls. I got tired just watching them. This non-stop movement doesn’t allow the characters to develop or the audience to grow attached to them. The few scenes that are stationary are filled with dialogue that simply goes around in circles, not providing many laughs. The wordplay banter becomes tiresome as the film goes on (it reminded me of one of the reasons so many viewers stopped watching “Modern Family” five years ago). There are positive (if obvious) messages in “Missing Link”, but they’re forced on us. Timothy Olyphant voices a creepy hitman out to kill Frost and Link. This type of character, and what it represents, is nowhere to be found in the four previous Laika films. While the joy and wonder of those others is practically non-existent here. Laika remains at the top of its game when it comes to the look of their animation. The studio unveils new 3D technology with the pic. But all major studios (and many minor ones) can produce great animation these days. What “Missing Link” is missing is a concept that offers deep, interesting, funny, moving, vibrant material. It’s ironic that, with a film about evolution, Laika has actually taken a step backwards. On The Official LCJ Report Card, “Missing Link” gets a C.